Designed to make the run-up to Christmas memorable for the whole family, we’ve rounded up the most creative (and gram-worthy) ways to celebrate the festive season. Whether you’d like to count down the days by adding a new decoration to the tree or can’t wait to stick a cosy film on the telly, look no further for inspiration this Christmas. Leave it to the Scandi bloggers to come up with the most gram-worthy advent ideas this festive season. Over on one of our favourite Danish accounts, Louise demonstrates how to make an alternative calendar which is bound to make the run-up to Christmas fun for the whole family. Forget chocolate, Advent packages enable you to hide everything from sketch pads to mini board games – designed to keep the kids entertained in the holidays (especially if snow is forecast). 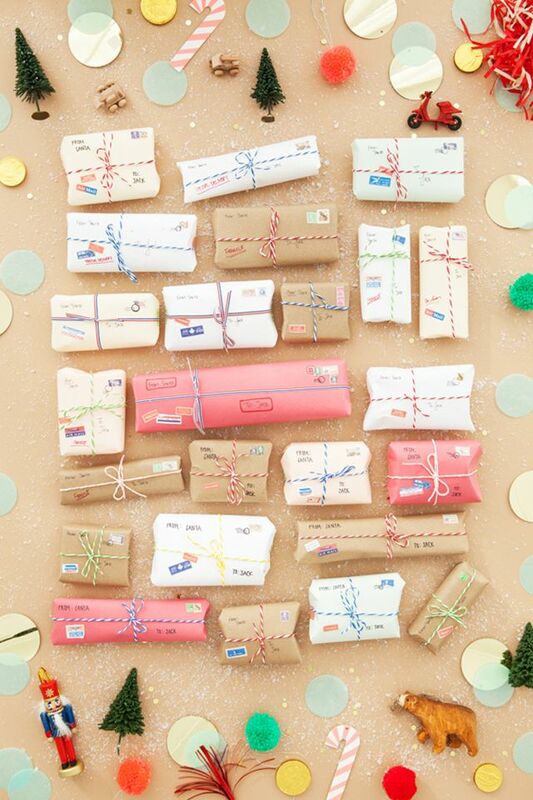 Other ideas include stocking the parcels with ornaments your children can gradually decorate the tree with. As shown by Louise, you can decorate each box as you wish using gift wrap, glitzy bows and ribbon in keeping with your home decor. The tree shape was cut from wood then finished with mounted wire in order to hang the 48 packages up securely. For those of use who can’t wait to kick-start the festive season, if you’re going to go for it – you may as well really go for it. And you needn’t fork out a small fortune for one of those luxe beauty advent calendars your work colleagues keep bragging about. Simply clear out a chest of drawers at home (and stash any hidden presents out of sight once more) to make room for a giant take on an advent calendar. Whether you’re planning to let the kids run loose or it’s designed as a well-deserved gift for yourself, there’s room for chocolate coins, mini beauty must-haves and keepsake pressies. As the interiors brand points out, it’s designed for families to make memories this festive season. Christmas brings out the child in all of us and who said you had to wait until the big day to open your presents? A DIY gift box advent calendar by Maggie Holmes Design will make the run-up to Christmas even more exciting for the whole family. You can choose the size of the boxes as you wish and can wrap bigger gifts for the likes of Christmas Eve and Christmas Day. A white wooden branch was used to hang the calendar while transparent nylon thread helps to suspend each box. For full instructions on how to create the gift box advent calendar this year, head over to the Maggie Holmes Design website. Decorating the Christmas tree is undoubtedly one of the most beloved festive traditions across the globe. So if you really want to make the event memorable then an ornament-laden advent calendar is just the ticket. Over on the Dilli Dalli blog, you can downlod free printable labels ready to go and all you need to do is add a bauble or decoration of your choice to each day. The memorable advent calendar will make the countdown to Christmas even more exciting, as you watch the tree dress up in preparation for the big day. For a step-by-step guide on creating the alternative Christmas calendar, head over to the Dilli Dalli blog. Is the big question: do we dig out our ‘Home Alone’ DVD collection or stick ‘The Grinch’ on the box come December 1st? If choosing a Christmas flick sparks arguments in your family then look no further for the ultimate solution this festive season.